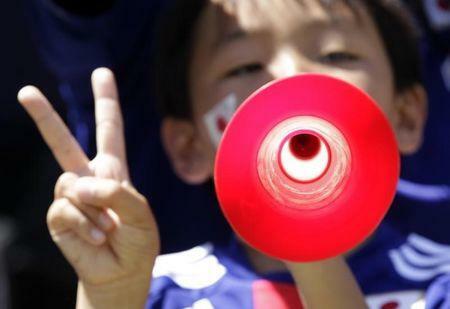 GENEVA (Reuters) - Sports fans risk having their hearing ruined by vuvuzela trumpets and deliberate attempts to increase stadium noise and they need to start seeing earplugs as something cool, the World Health Organization said on Friday. Shelly Chadha, a WHO expert on preventing deafness, said some U.S. sporting crowds consider breaking noise levels as an achievement, and cited a 136.6 decibel world record claimed by Seattle Seahawks fans in 2013. "Anybody who is exposed to 136 dB for even a minute is going to face some consequences," she told a news conference. Vuvuzelas, the blaring plastic trumpets that became the icon of 2010 soccer World Cup in South Africa, can have a sound intensity level of 120 dB - unsafe for more than 9 seconds a day. Asked if they should be banned, Chadha said: "Yes, well, vuvuzelas are certainly something we can live without." Around 1.1 billion young people are at risk from hearing loss, the WHO said, in addition to about 180 million who have already suffered preventable damage to their hearing. As well as sporting events, there are risks to hearing at nightclubs and from listening to smartphones, and the solutions include volume limits, noise-cancelling headphones and earplugs, which can reduce noise levels by 30 decibels, turning the roar of a fighter jet into little more than a hair dryer. The damage is irreversible, although there may be some hope from research into stem cells and into some fish that can regenerate hearing cells, Chadha said. "At the point when you can't understand conversation around you, you know that this is too loud," said Chadha.